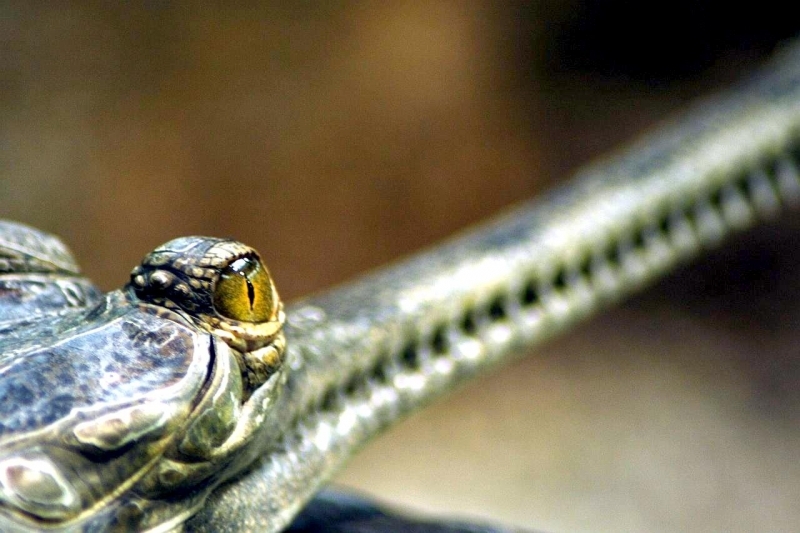 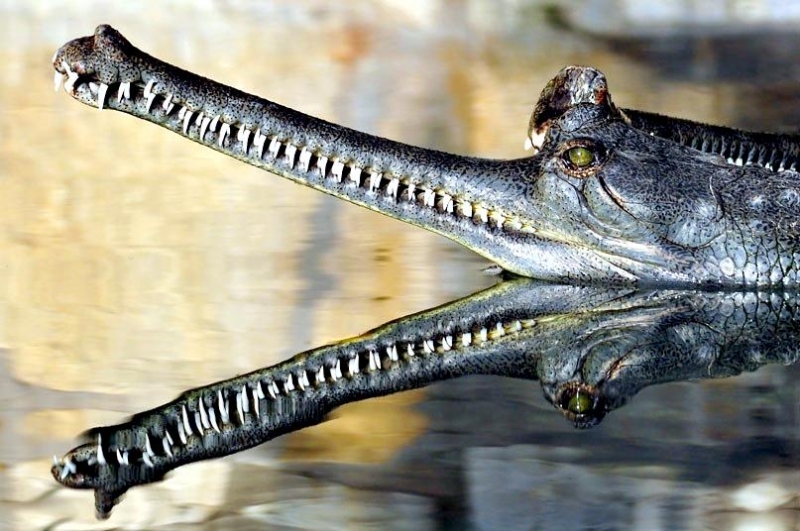 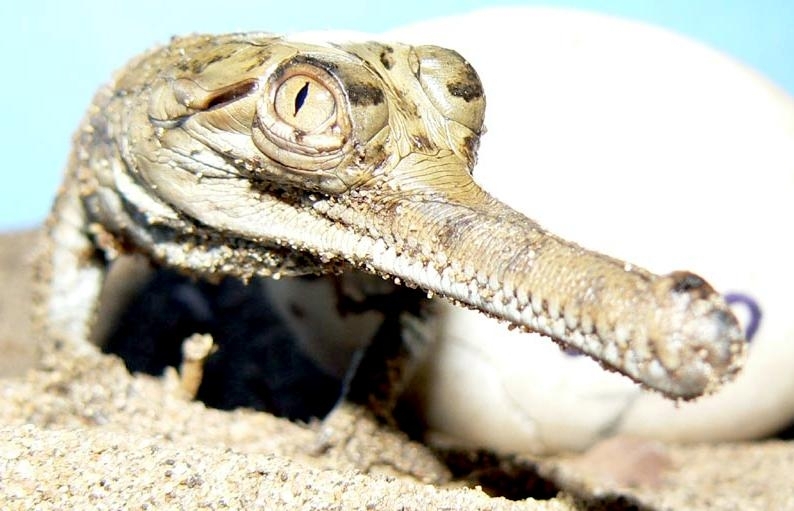 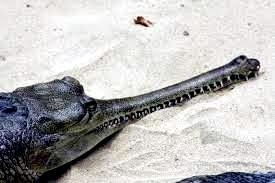 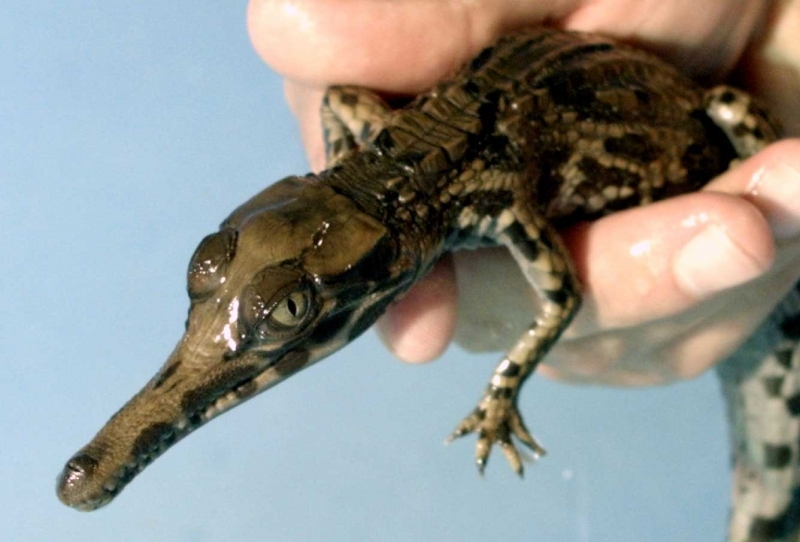 The Gharial has a characteristic elongated, narrow snout. 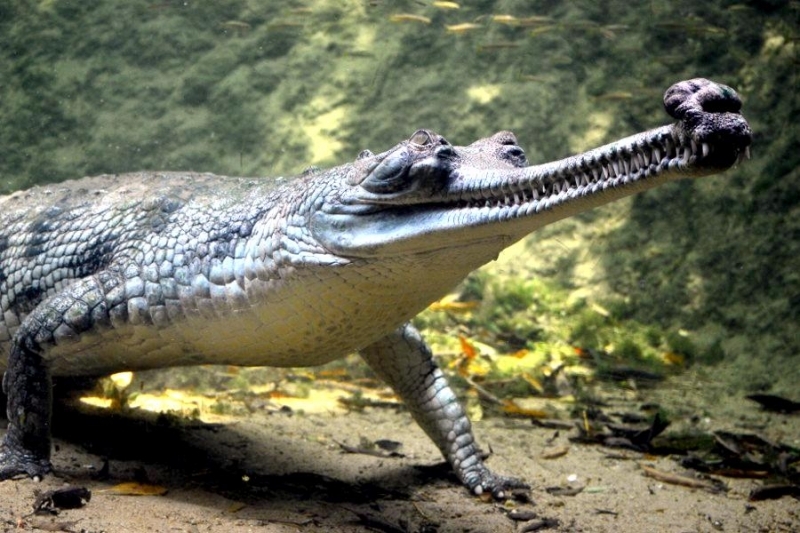 Variation in snout shape occurs with age. 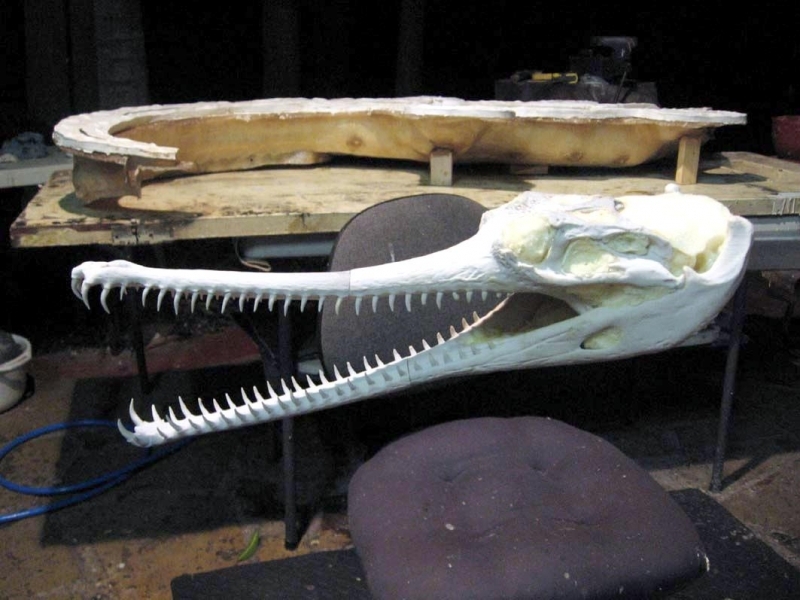 It generally becomes proportionally shorter & thicker with age. 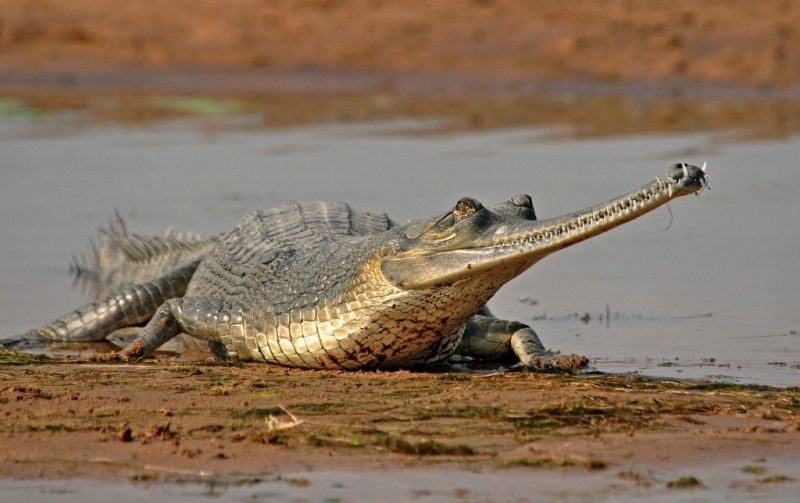 The bulbous growth on the tip of the male’s snout is called a “Ghara” (after the Indian word meaning “mud pot”) and is present in mature individuals. 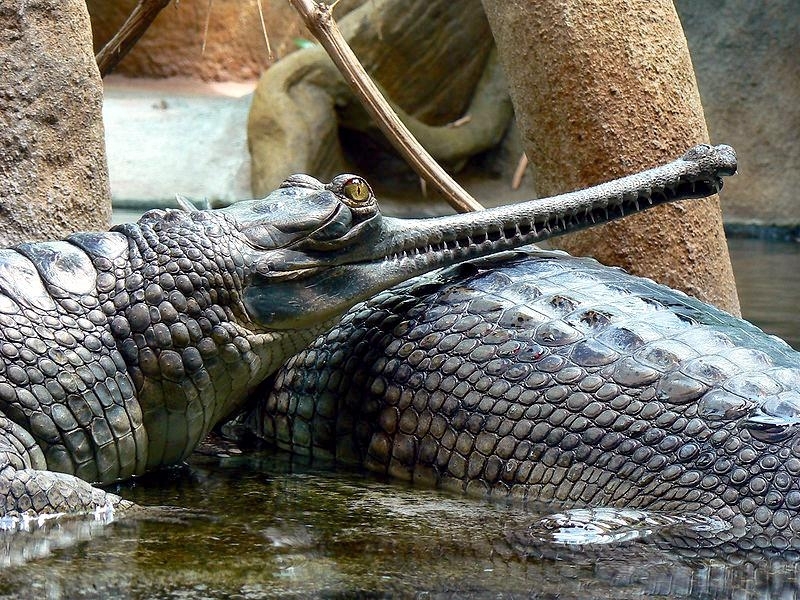 Possible functions have been attributed to it as a vocal resonator (which produces a loud buzzing noise during vocalization) and as a visual signal to females. 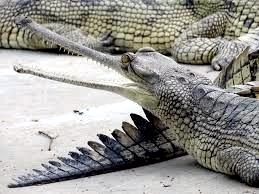 The elongated jaws are lined with many interlocking, razor-sharp teeth, an adaptation to their fish diet. 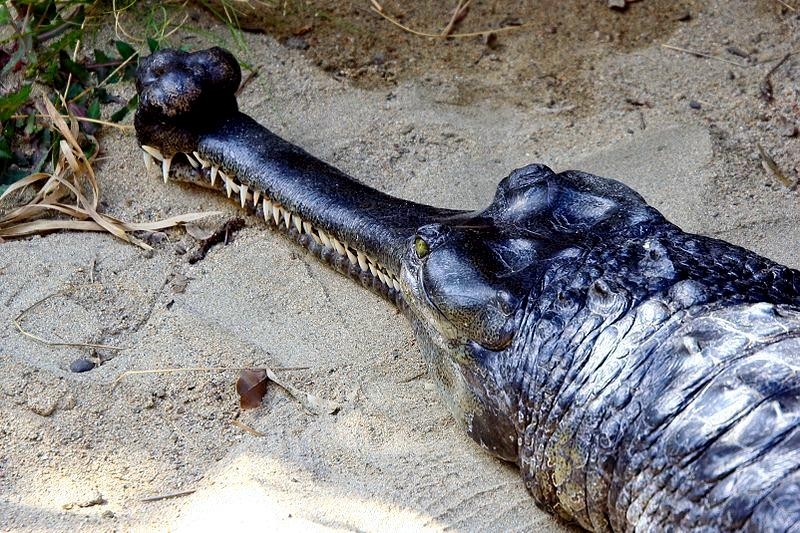 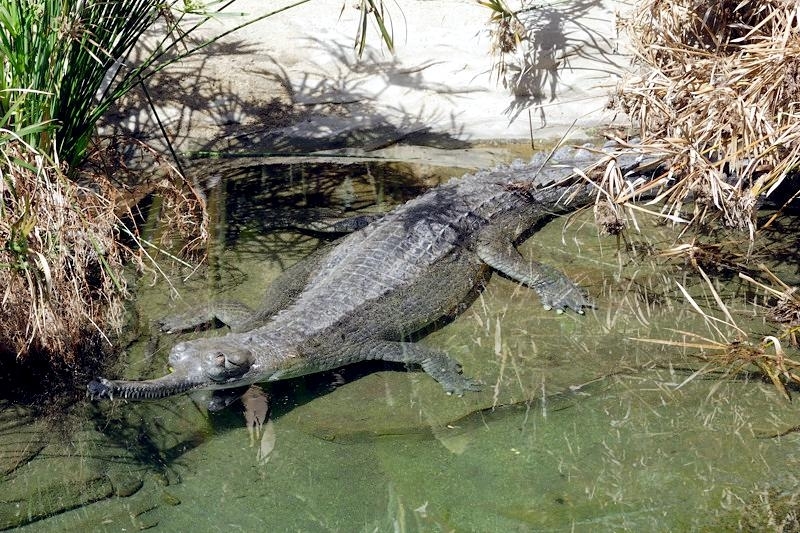 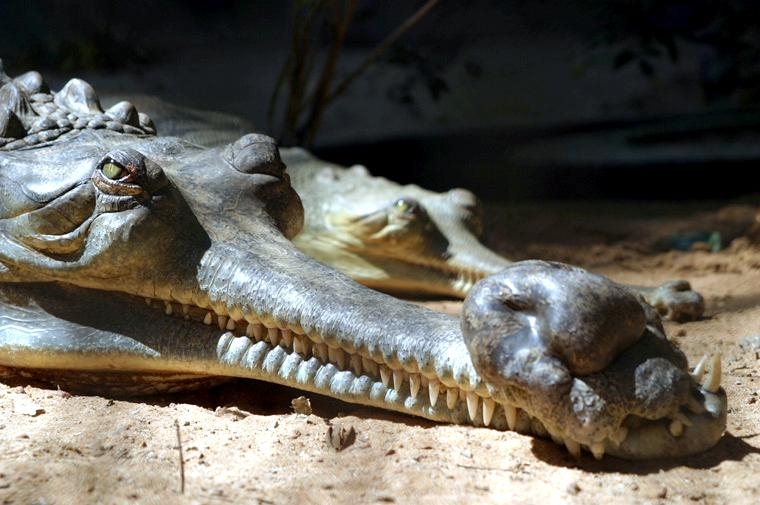 The Gharial is one of the largest of all crocodilian species approaching the Australian Saltwater Crocodile, the largest crocodilian in maximum size. 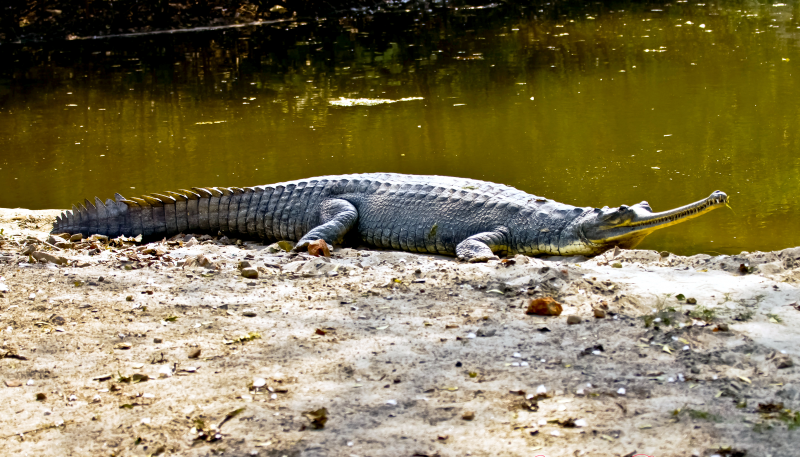 Males reach 20-23 feet (6-7 meters) in length. 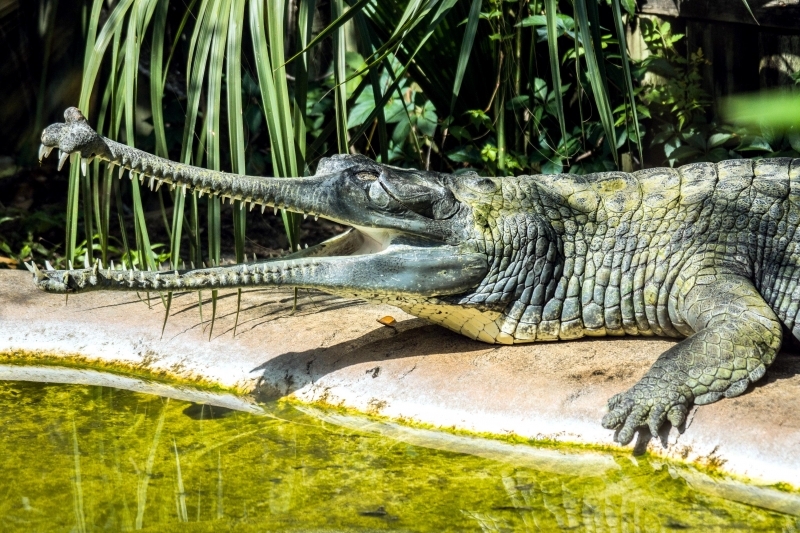 The Gharial is poorly equipped for locomotion on land. 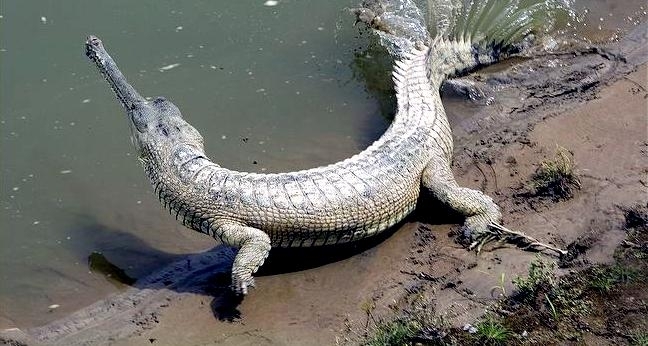 Its leg musculature is not suited to raise the body off the ground or to produce the “high-walk” gait. 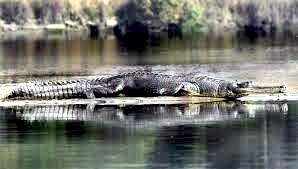 It is able only to push its body forward across the ground or “belly-slide.” It is however, very agile in the water. 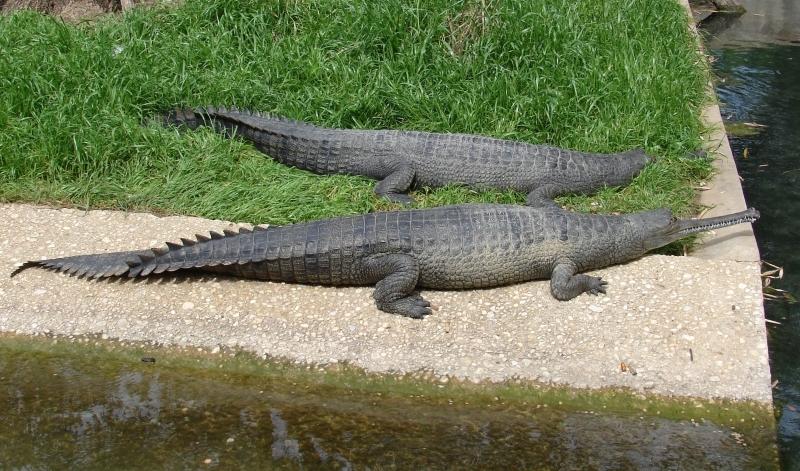 The tail is well-developed & laterally flattened and the rear feet possess extensive webbing. 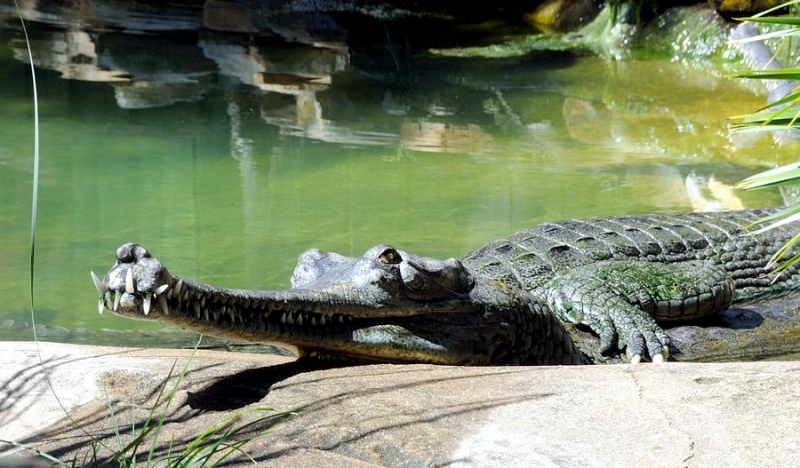 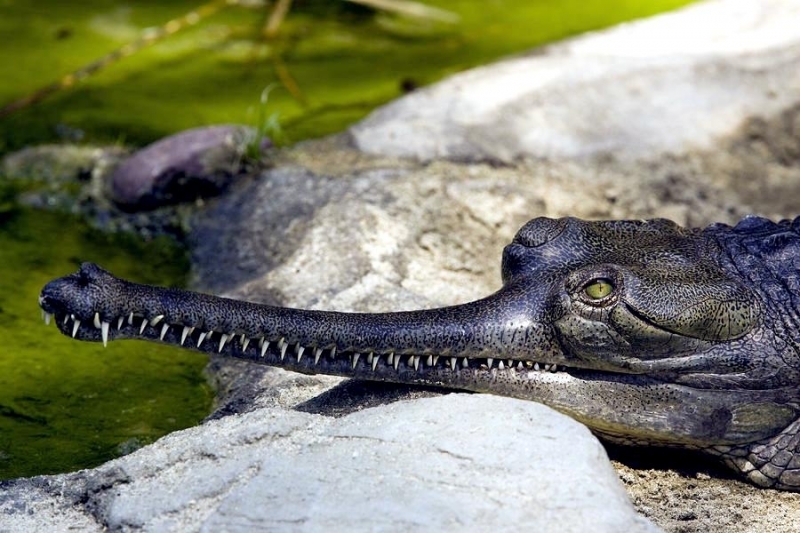 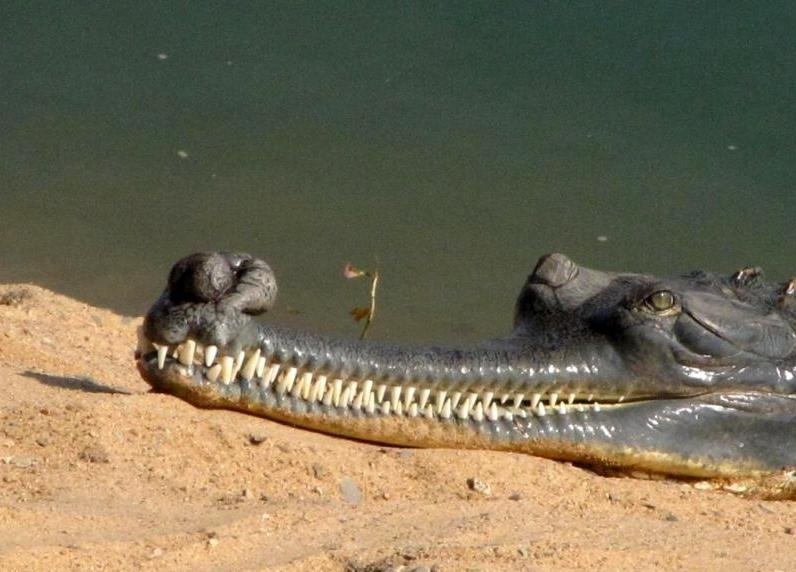 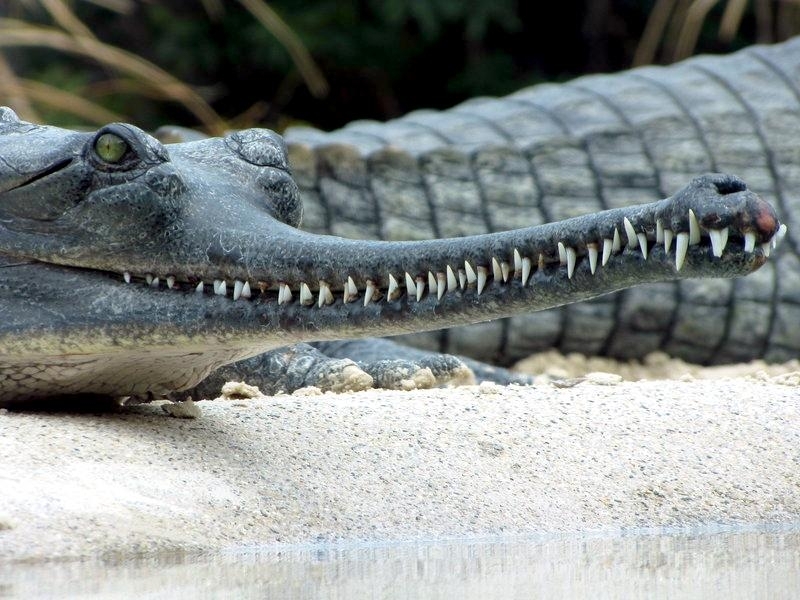 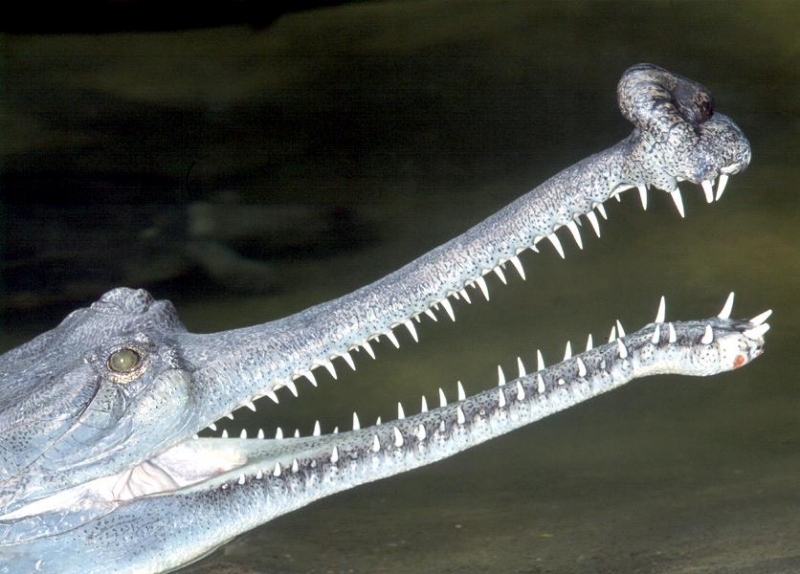 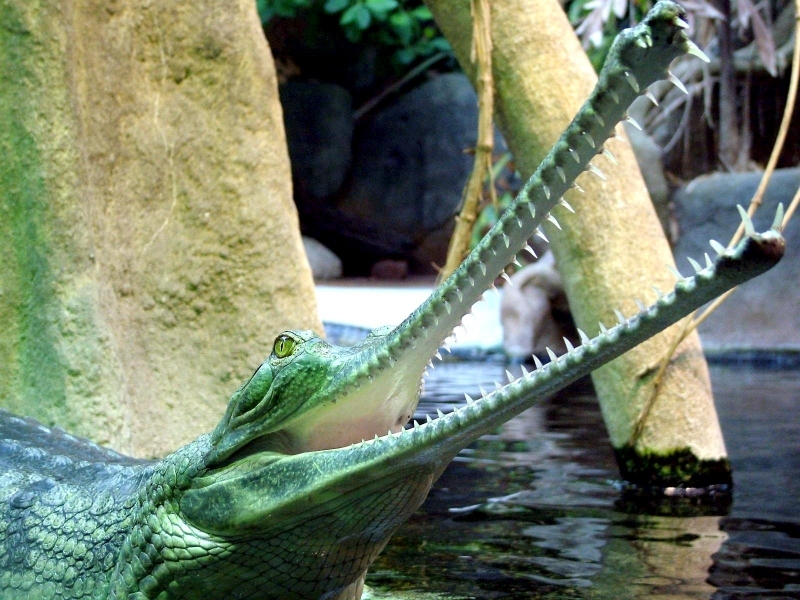 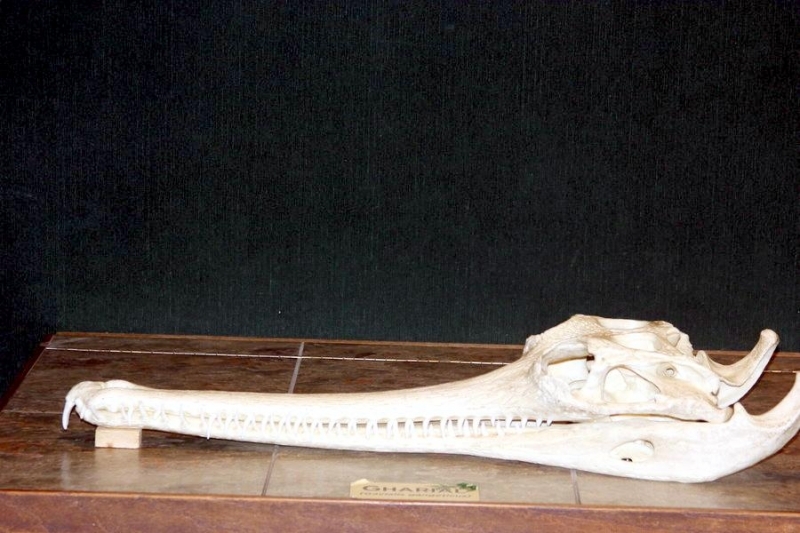 The Gharial has 106-110 teeth in the elongated snout. 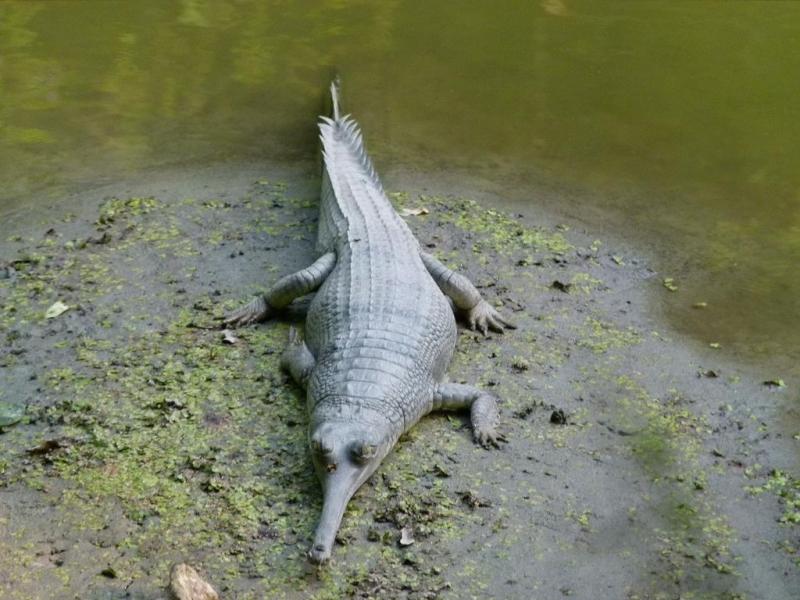 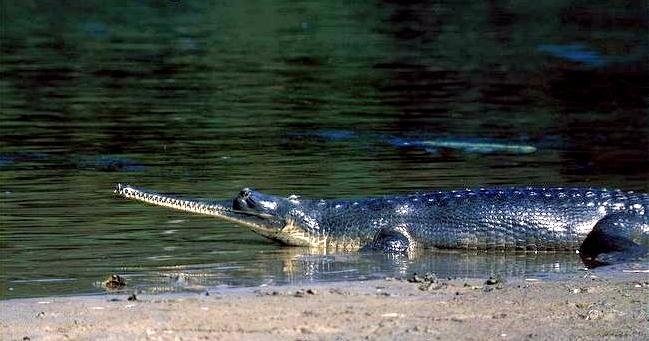 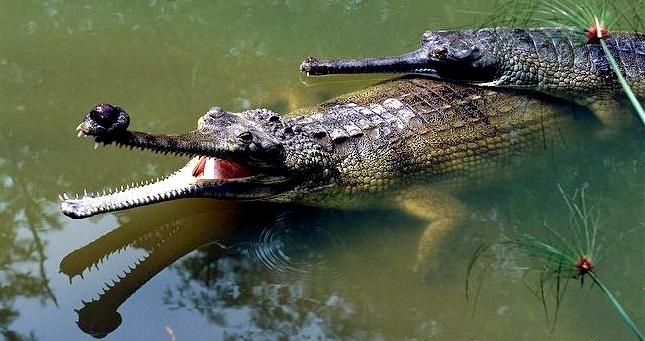 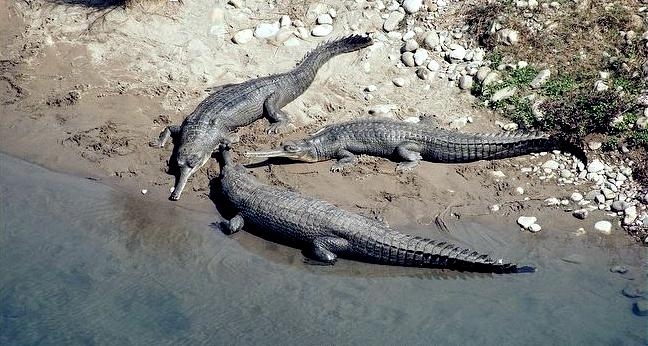 Gharials are found in the rivers of the northern India subcontinent, in Bangladesh where they are close to being extirpated, Bhutan (possibly extirpated), India, Burma (possibly extirpated), Nepal and Pakistan (close to being extirpated). 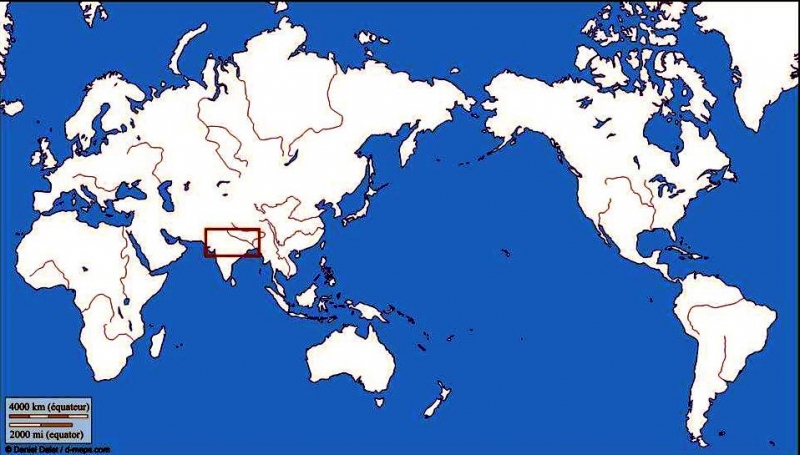 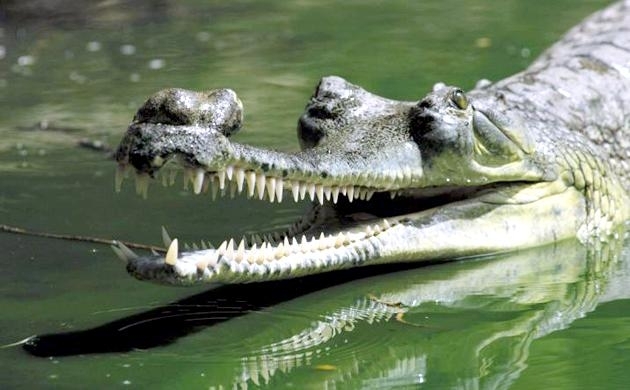 They are found within the river systems of the Brahmaputra (Bhutan and India), the Indus (Pakistan), the Ganges (India and Nepal) and the Mahanadi (India) with small populations in the Kaladan and the Irrawaddy in Burma. 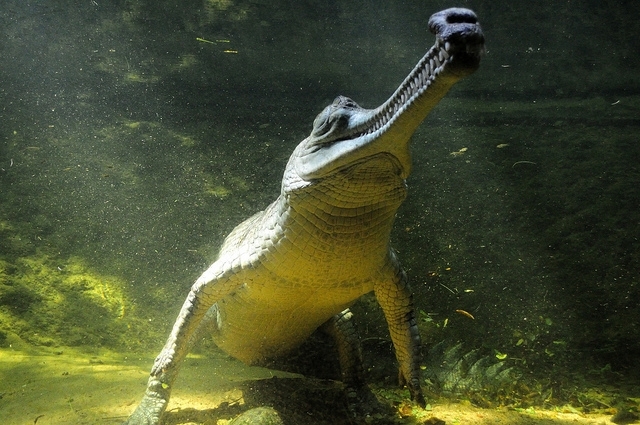 They are more adapted to an aquatic lifestyle in the calmer areas of deep, fast-moving rivers. 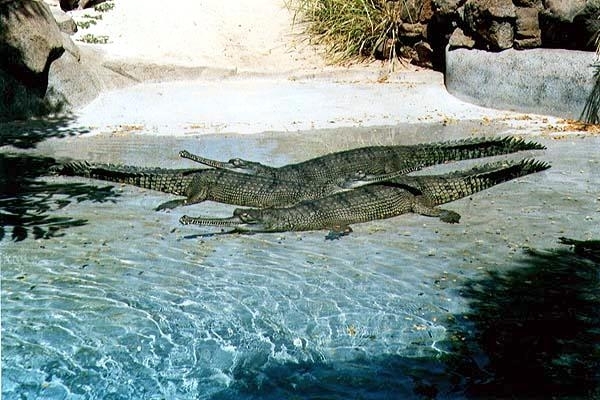 They usually leave the water only to bask & nest, both of which usually occur on sandbanks. 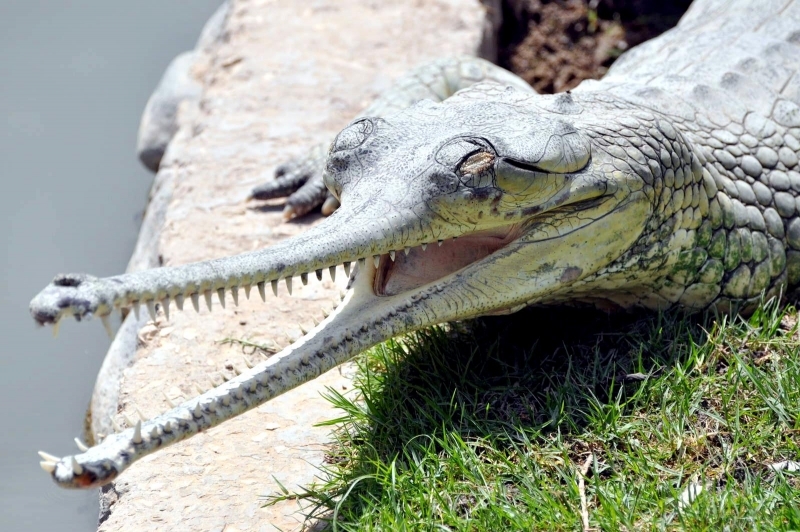 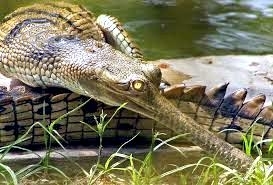 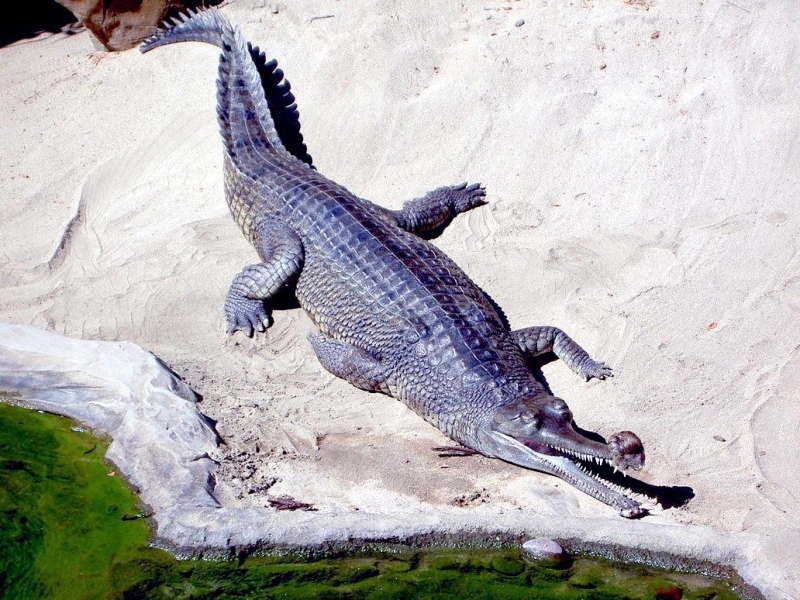 The diet changes as the Gharial matures from a juvenile to an adult. 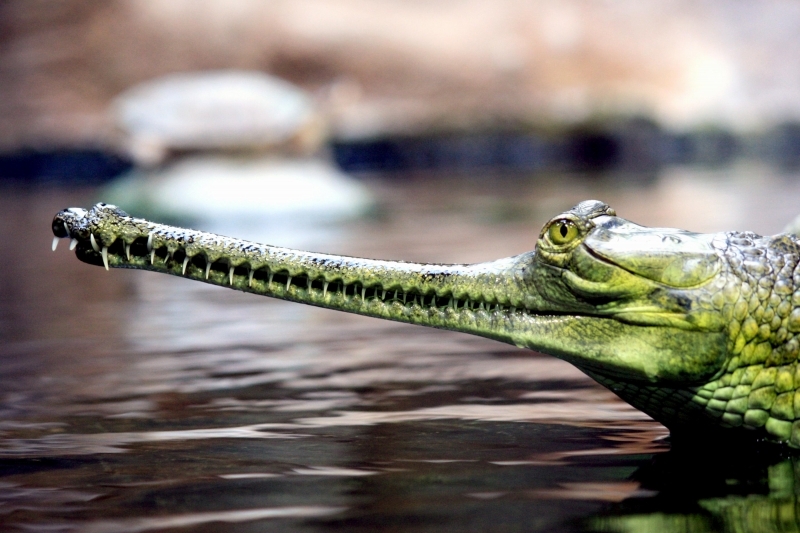 The juveniles are well suited to deal with a variety of invertebrate prey such as insects, plus smaller vertebrates such as frogs, but they primarily eat small fish. 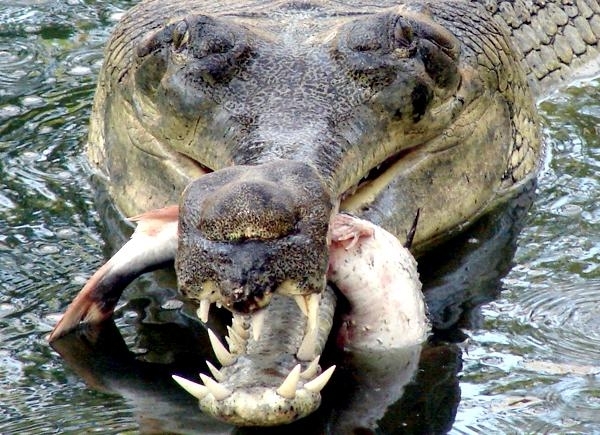 Adults are primarily fish-eaters, for which their jaws & teeth are perfectly adapted. 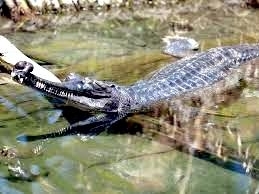 The thin shape gives the snout low resistance in water, which is suited to fast lateral snatching movements underwater. 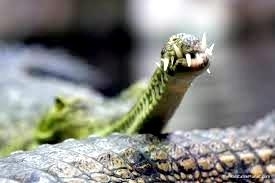 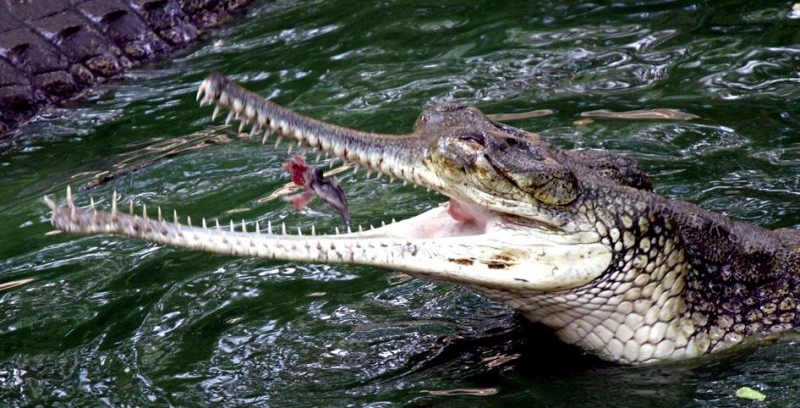 The teeth are ideally suited for holding struggling prey such as slippery fish. 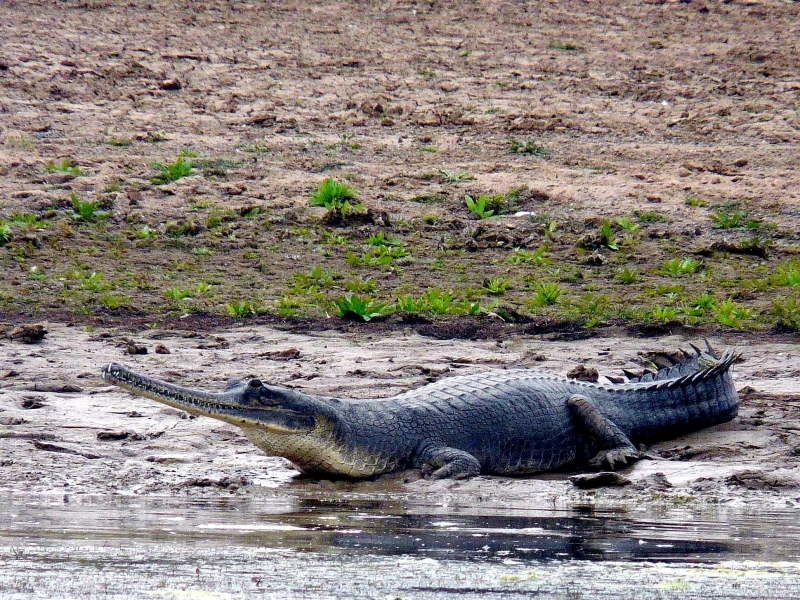 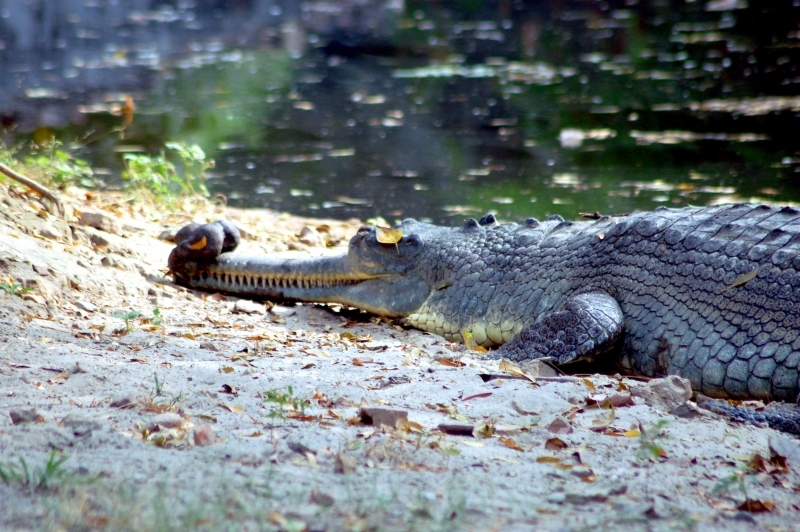 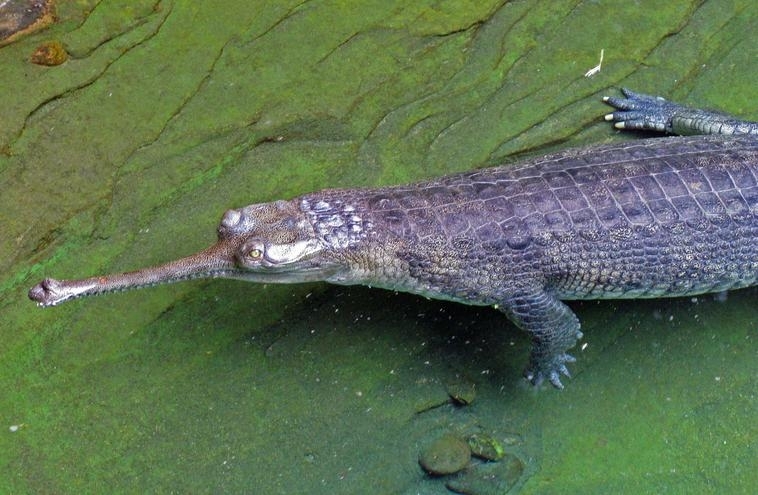 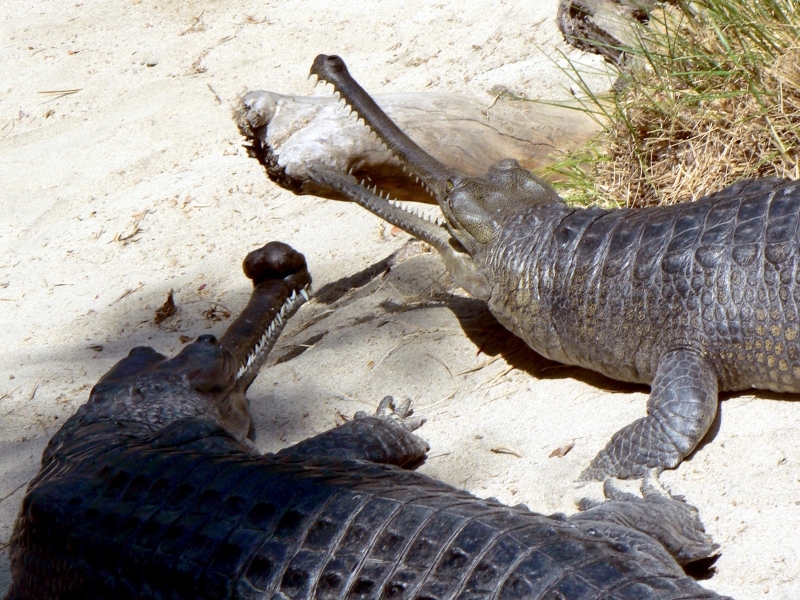 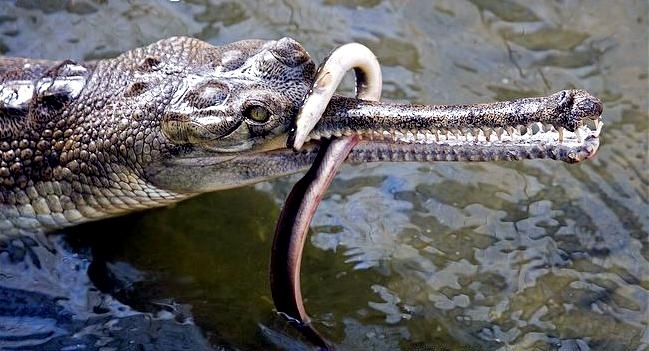 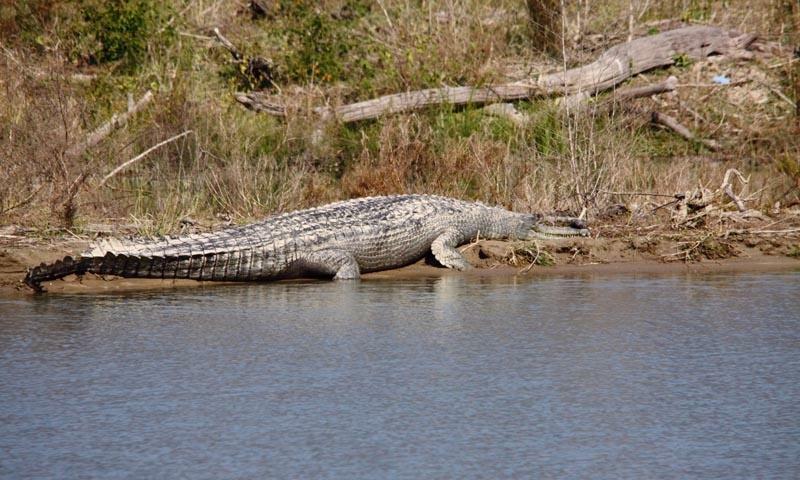 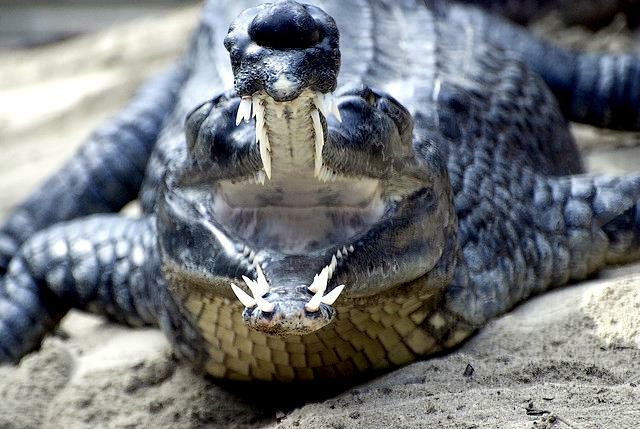 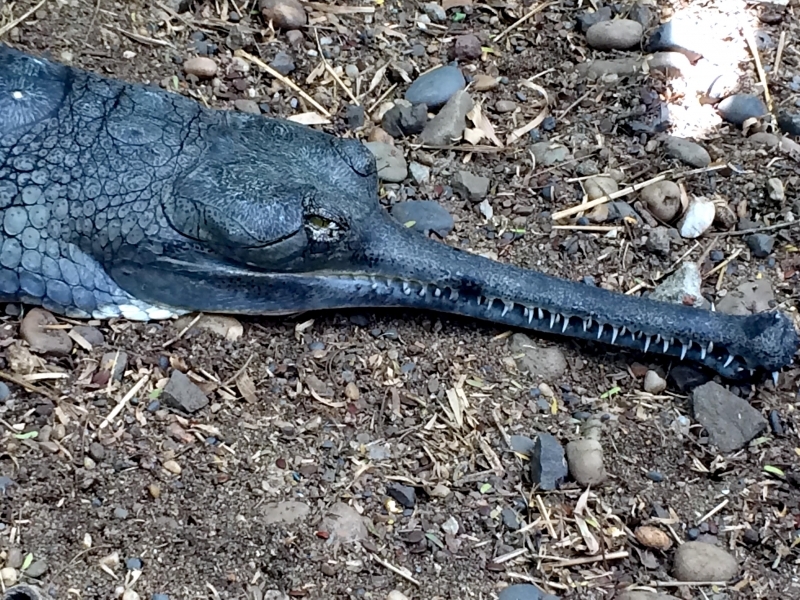 Some of the larger Gharials are more opportunistic and take larger prey including mammals. 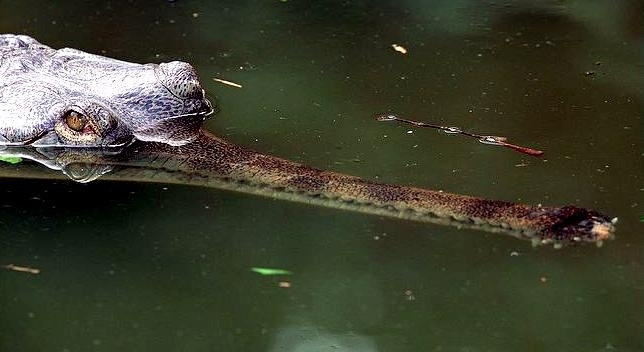 Females reach sexual maturity around 8-9 feet (2.4-2.7 meters) in length, this is usually when they are older than 7 years of age. 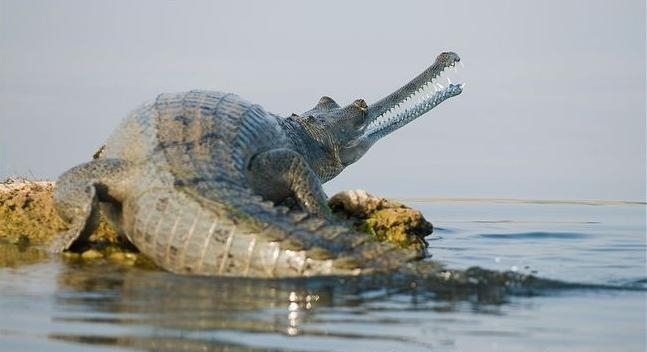 The males do not mature until about 13 feet (3.9 meters) in length at 15 to 18 years of age. 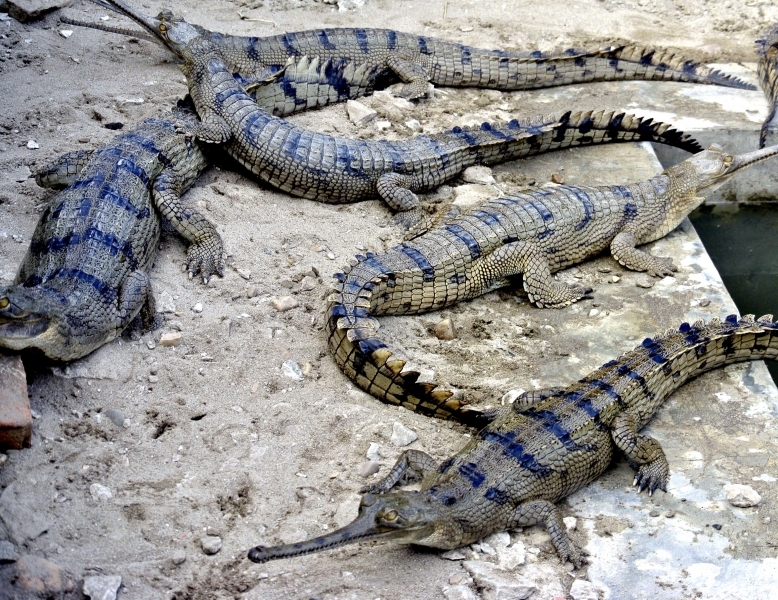 Males guard a territory in which several females live. 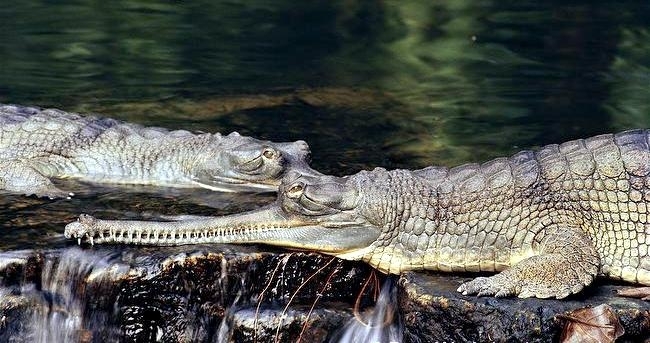 The mating period lasts for 2 months during December and January. 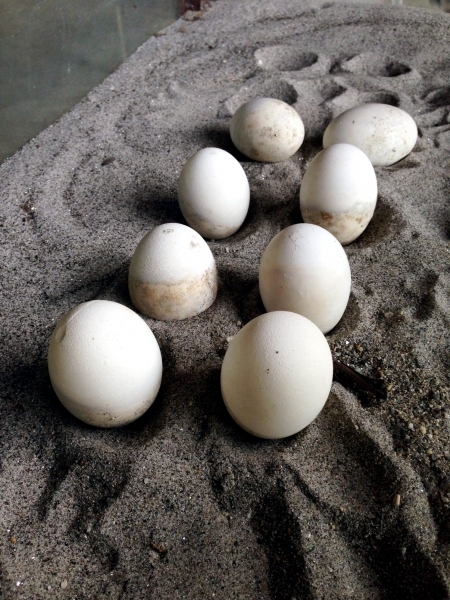 Nesting occurs from March to May (the dry, low water season). 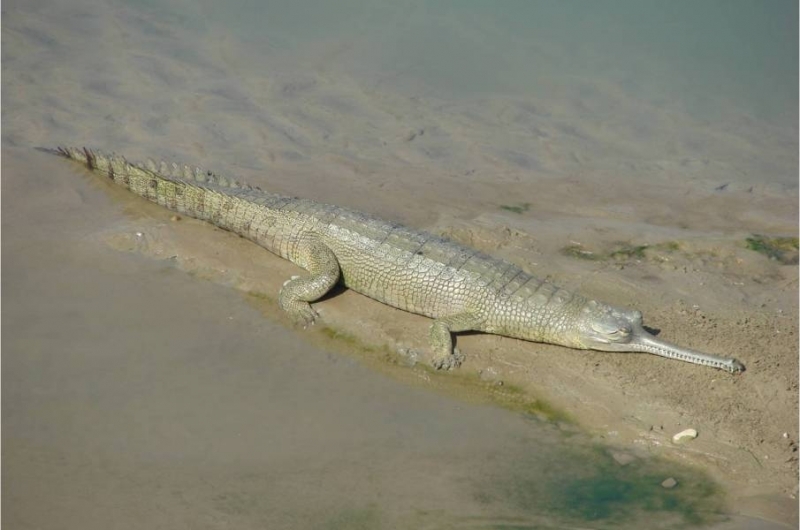 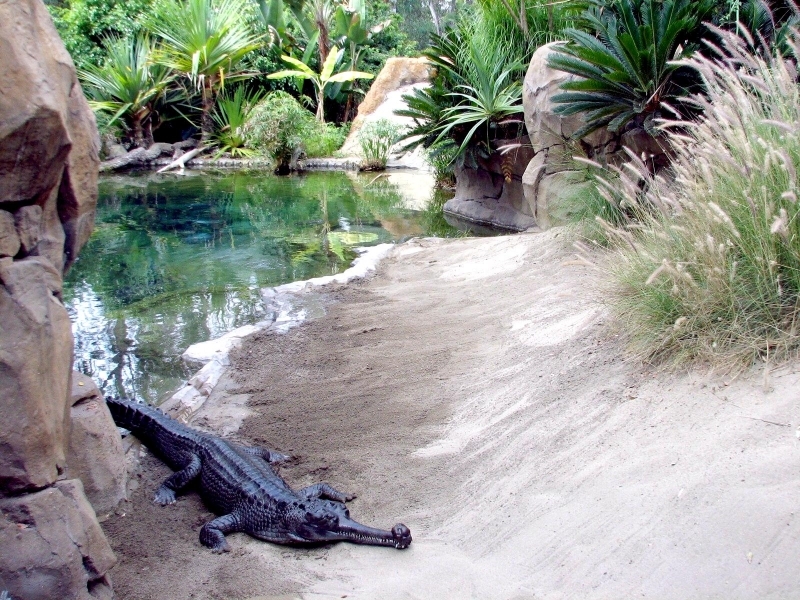 Gharials are hole nesters and excavate an egg chamber into the sandy banks above the flood line. 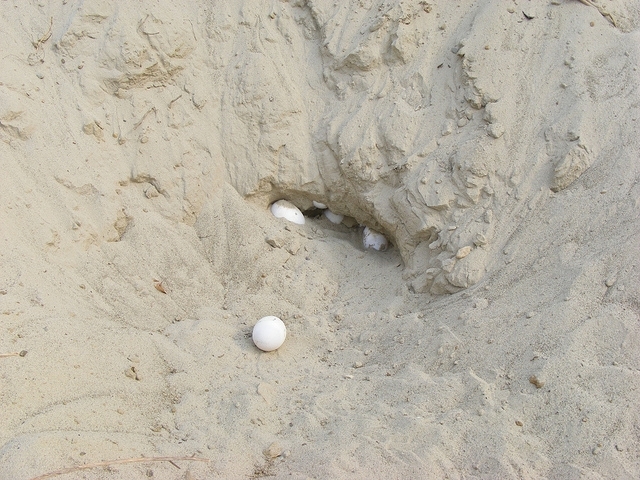 Up to 60 eggs are deposited into the hole before it is covered over carefully. 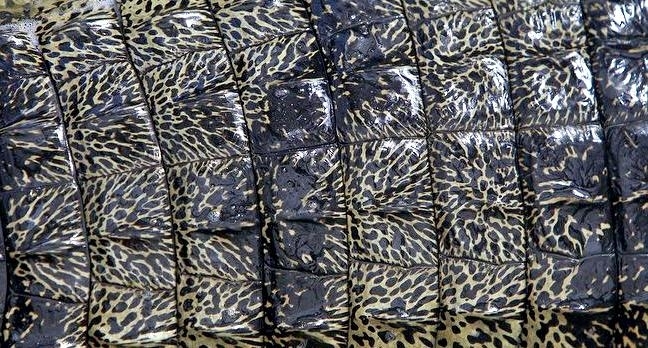 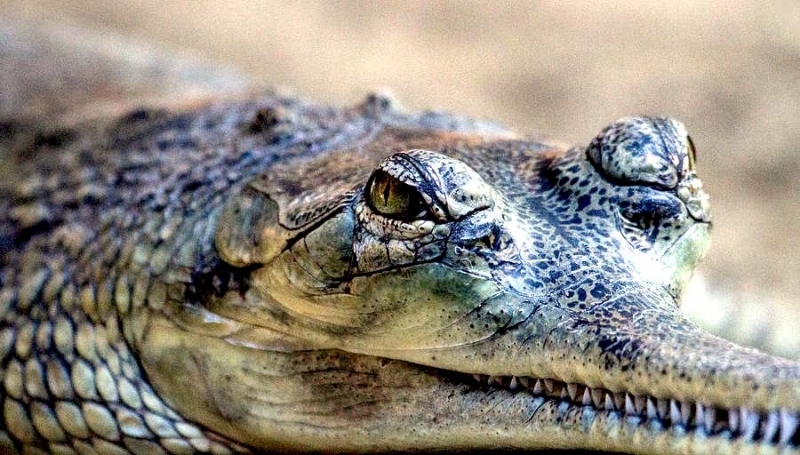 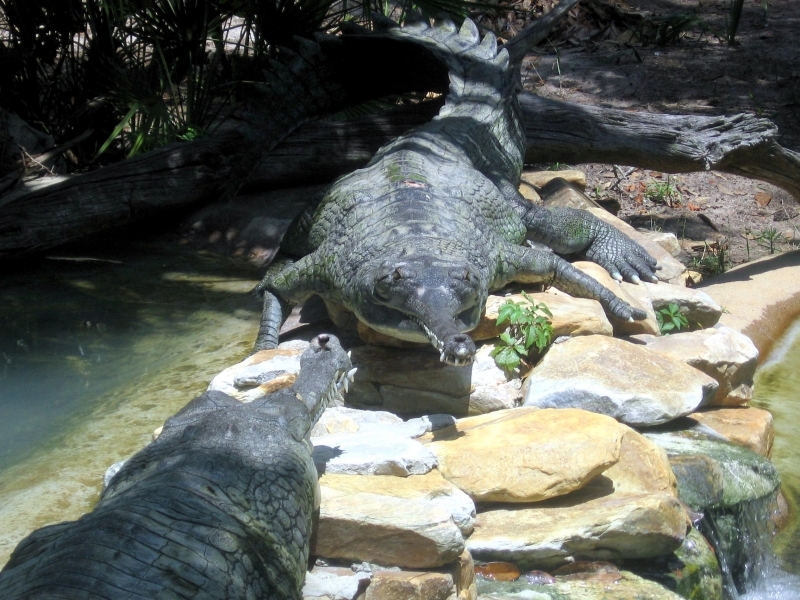 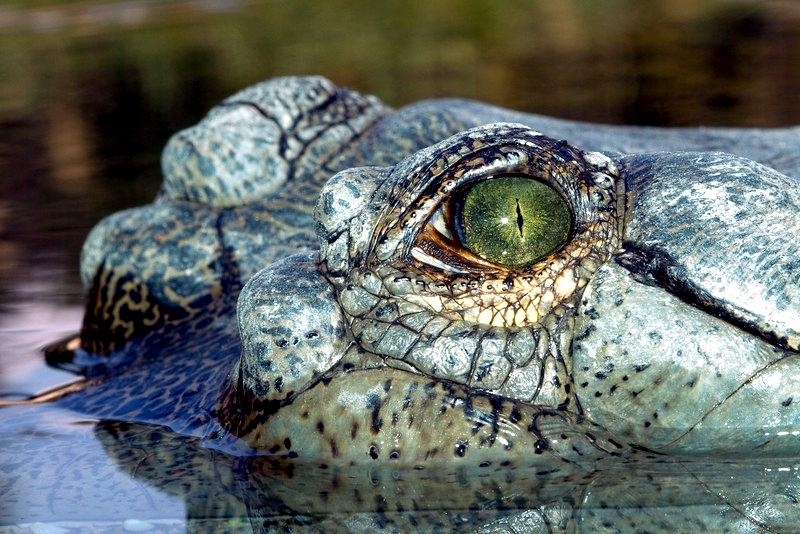 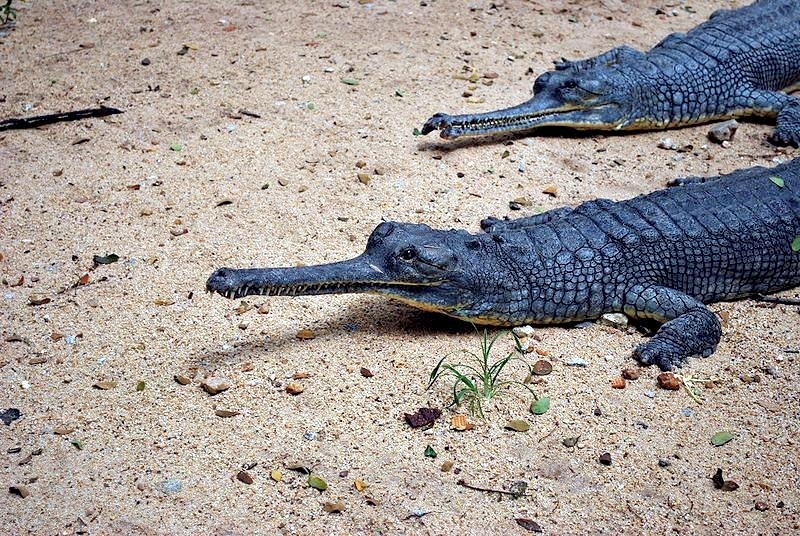 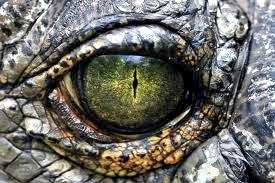 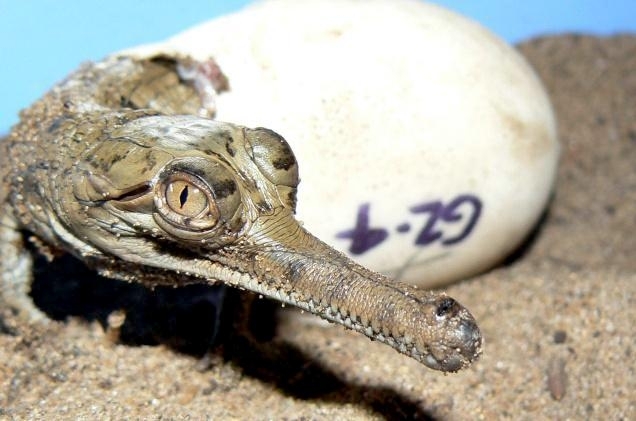 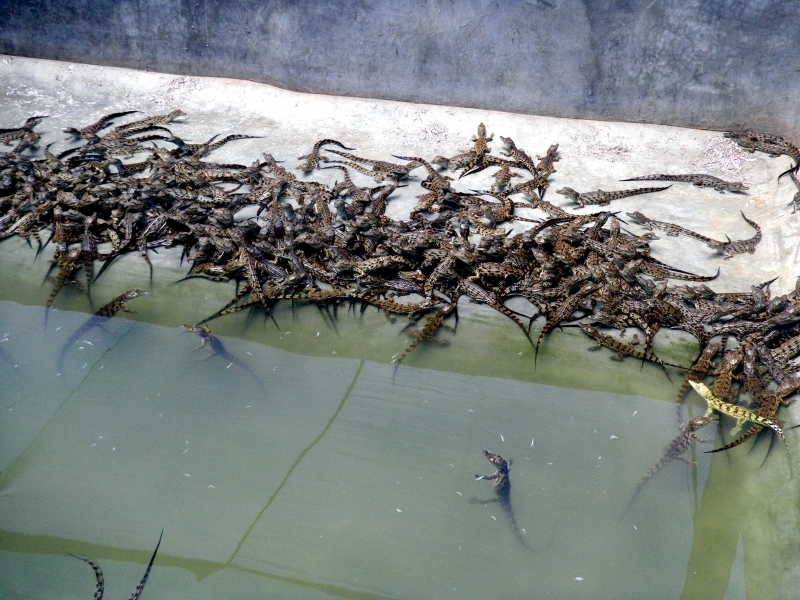 The eggs are the largest of any crocodilian species, weighing on average 6 ounces (160 grams). 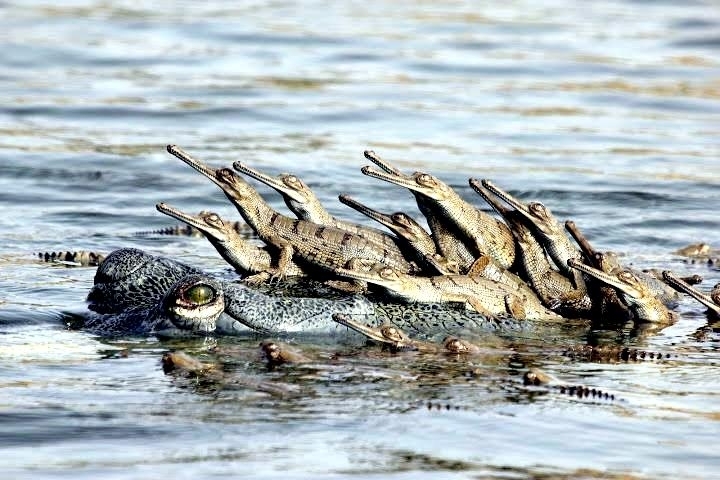 After 83 to 94 days, the hatchlings emerge and the females assist the hatchlings to the water as in many other crocodilian species. 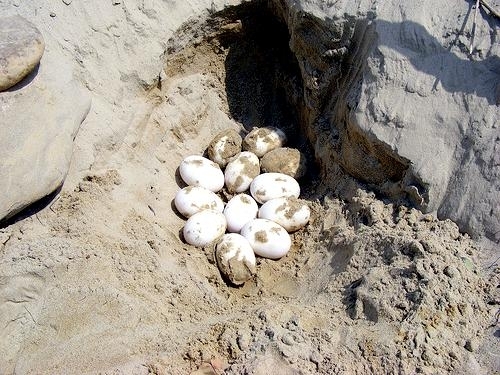 However, protection of the young does occur around the nesting area for some time after hatching. 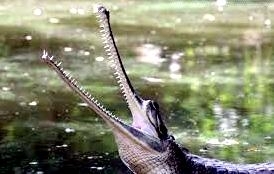 The major threat at present is habitat loss due to human encroachment & disruption of populations through fishing and hunting activities. 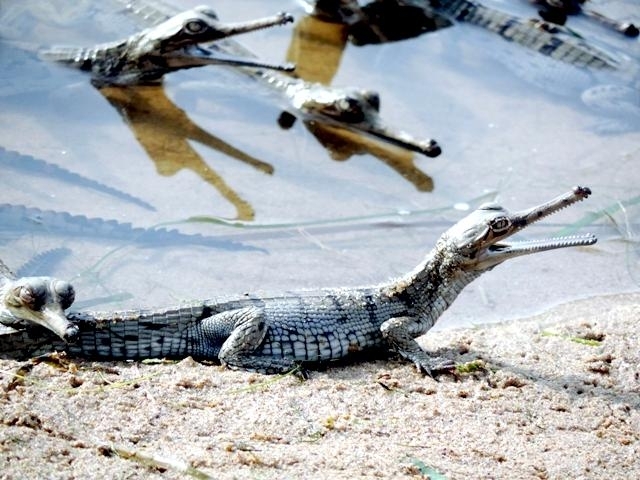 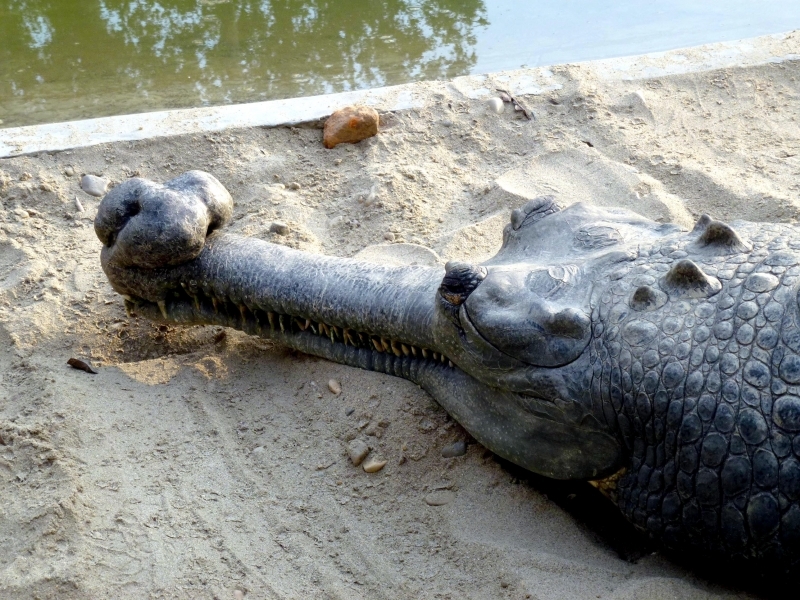 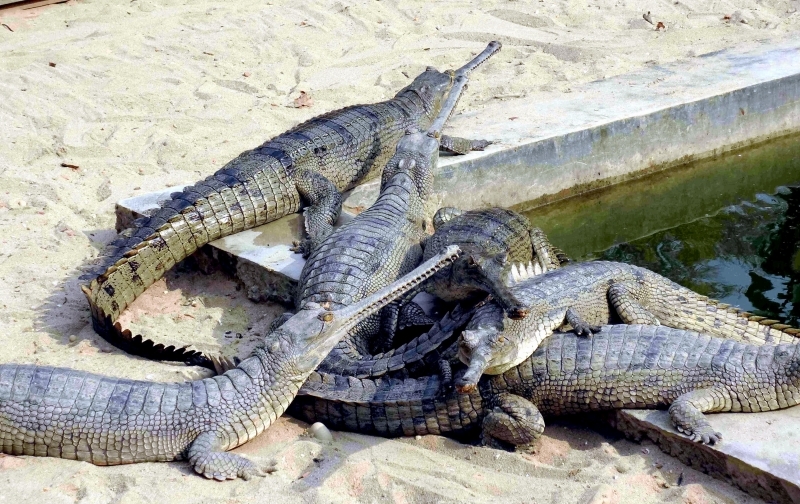 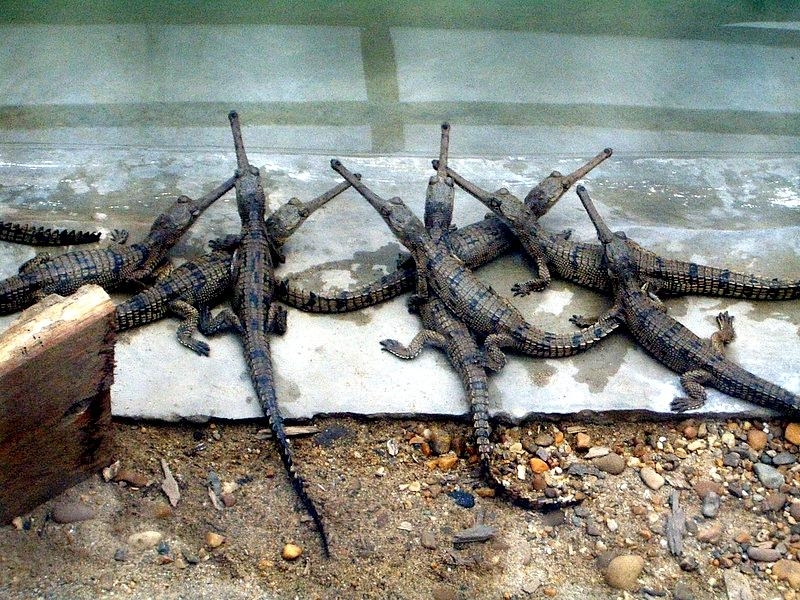 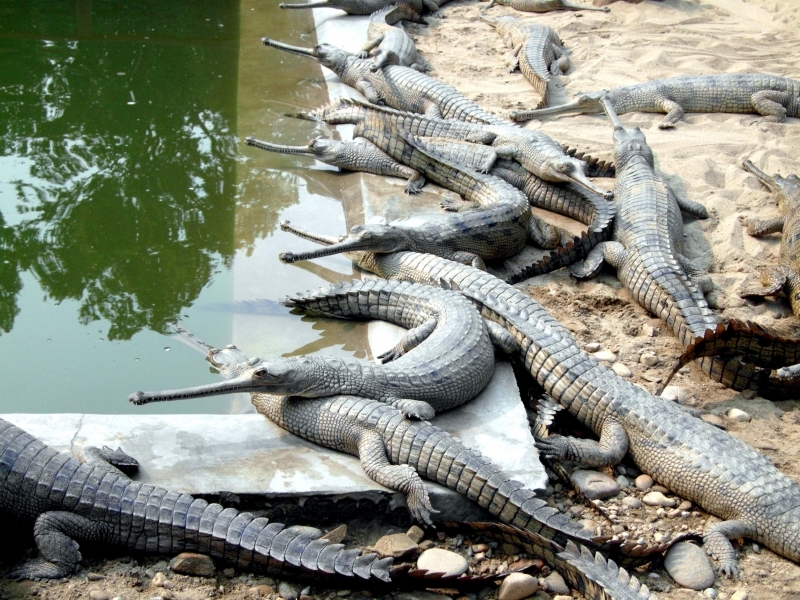 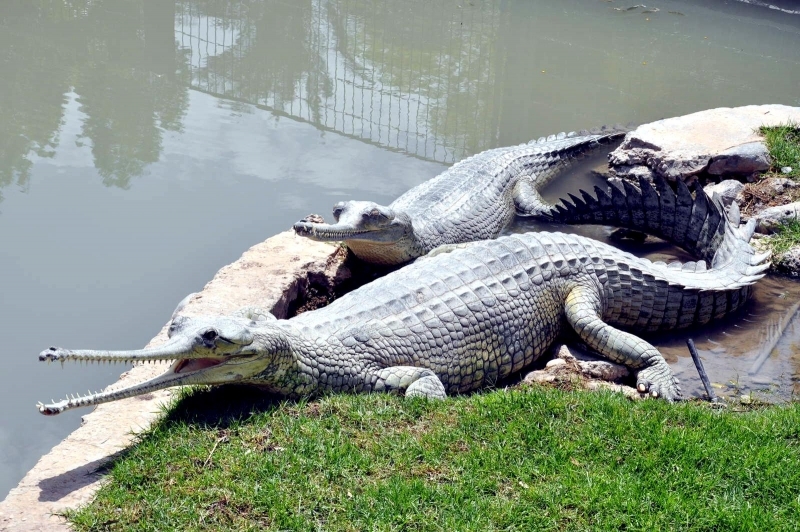 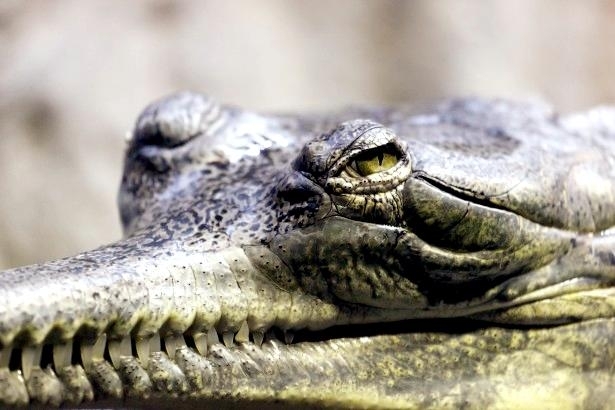 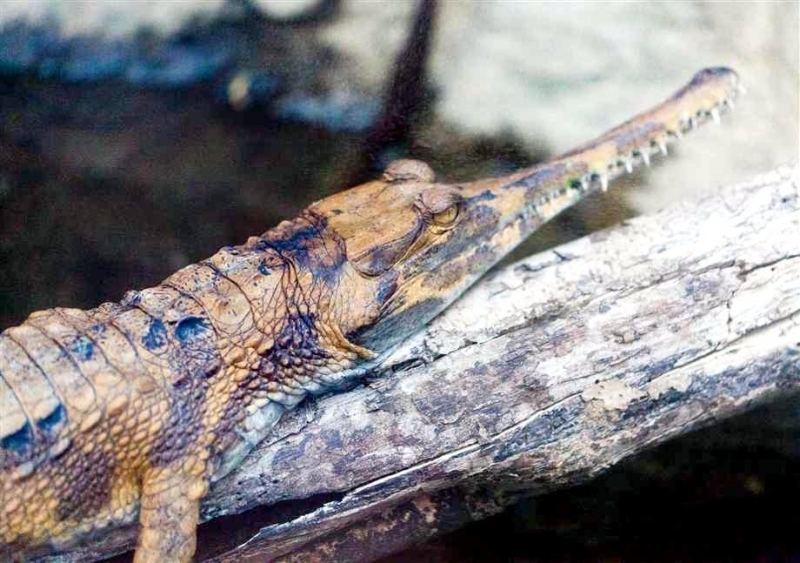 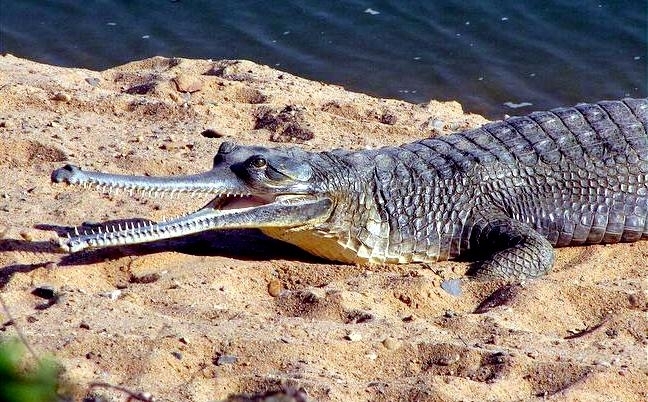 A lack of suitable release sites has also started to become a problem for the management of the Gharial. 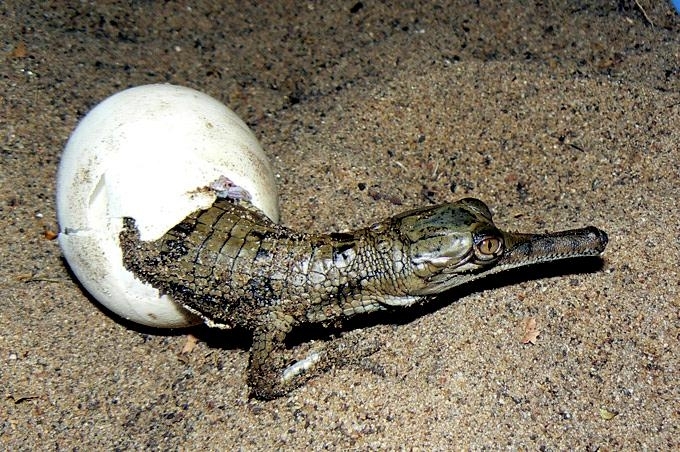 Eggs are collected for medicinal purposes and males are still hunted for the aphrodisiac properties associated with the snout. 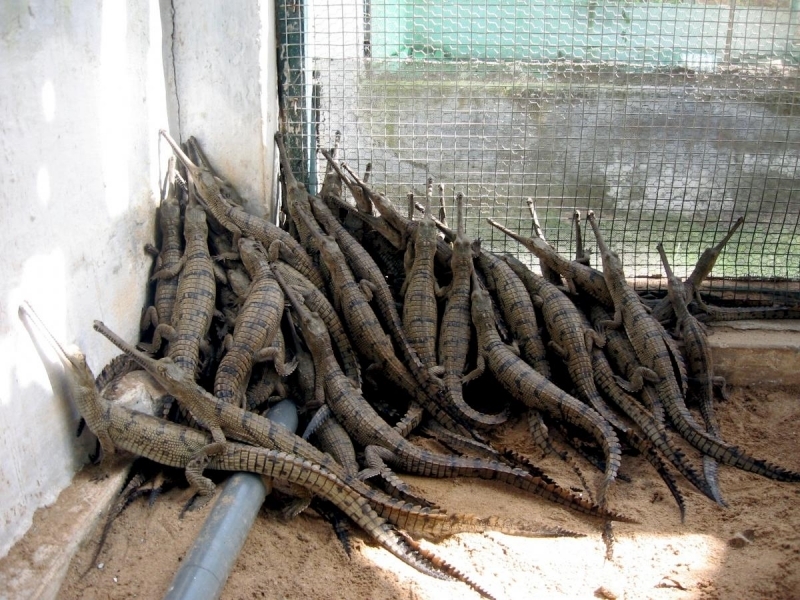 They may also be snared in fishing nets and killed by fishermen. 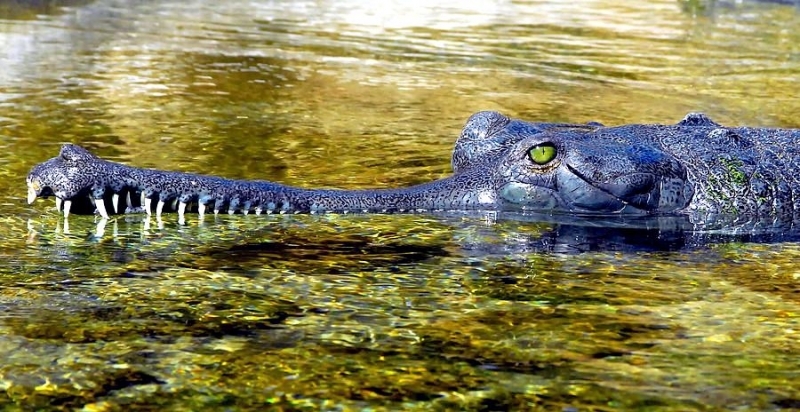 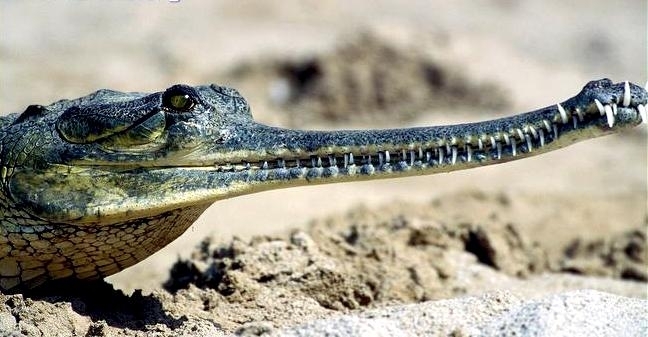 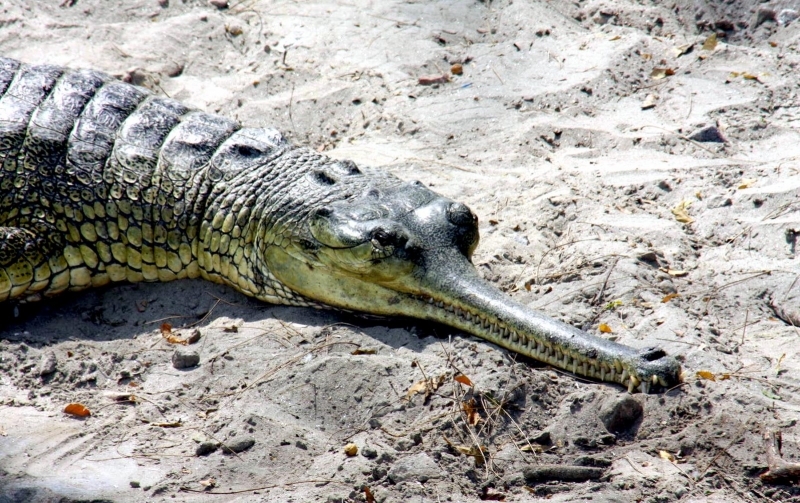 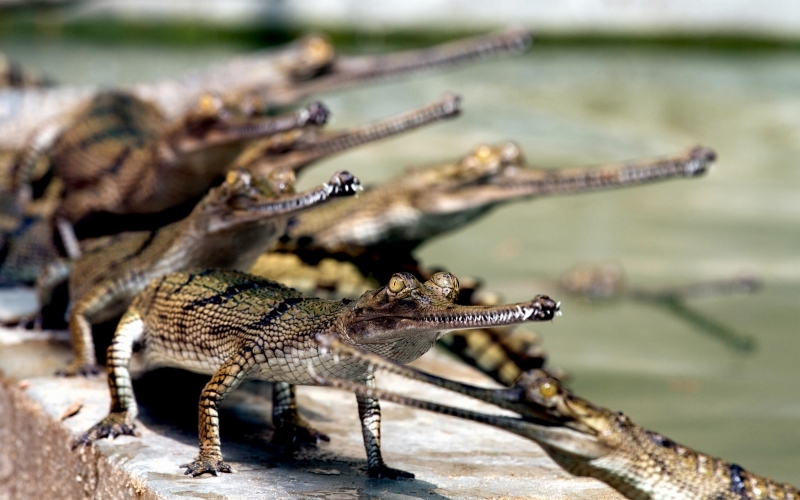 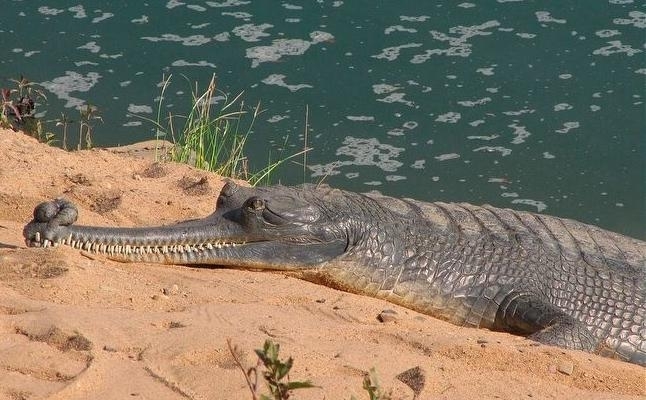 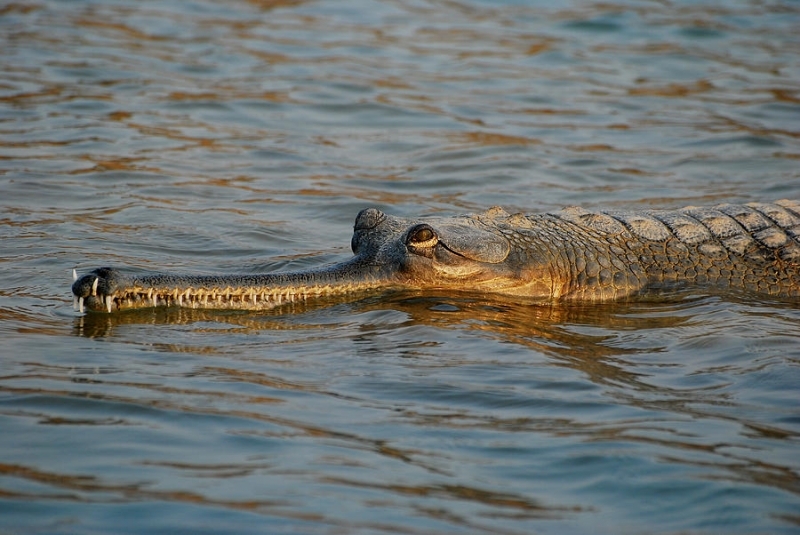 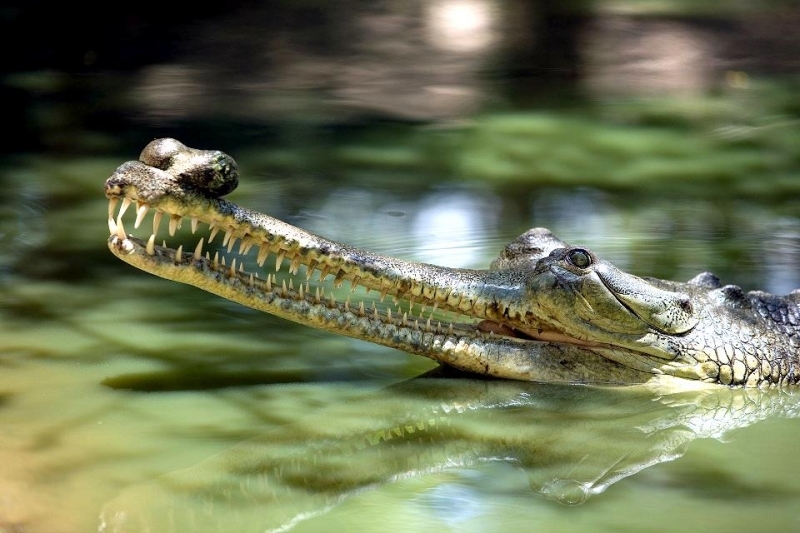 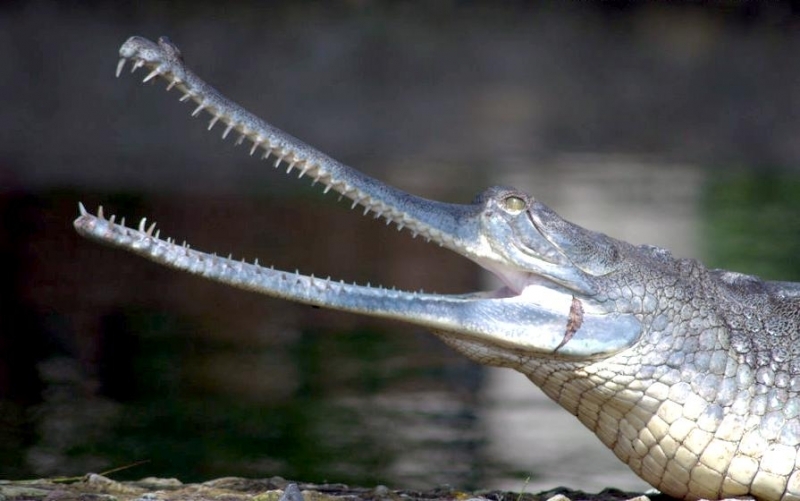 The decline in Gharial populations have been linked to a decline in fish catches, as predatory fish of no interest to the fishermen, form a major part of the Gharial diet. 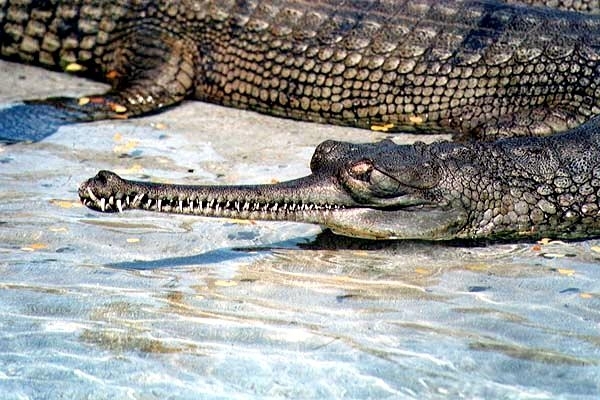 Although poorly equipped to devour a human, such ability has nevertheless been attributed to the Gharial and indeed most crocodilians. 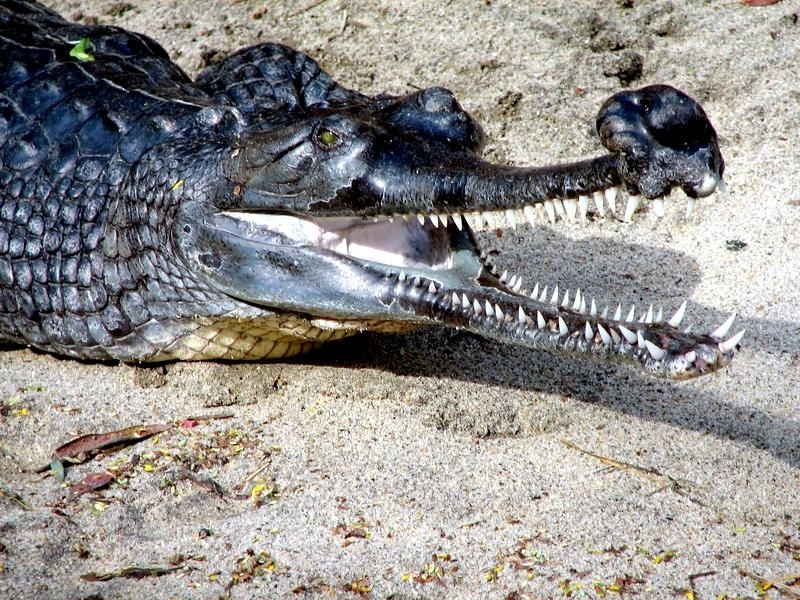 Human remains & jewelry have been found in their stomachs, serving to validate this fear. 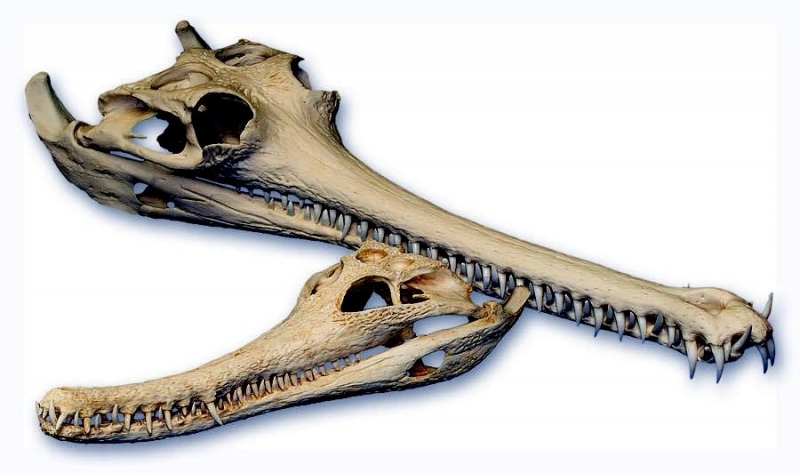 These were most likely scavenged from corpses. 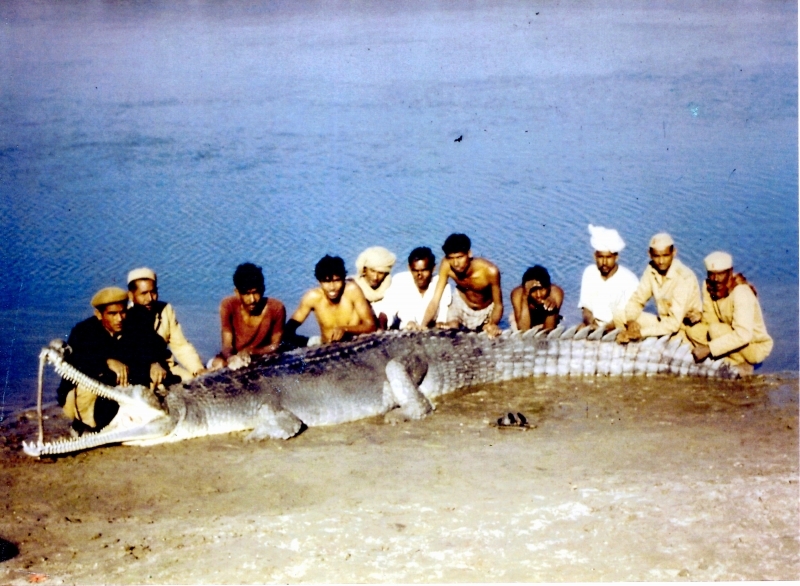 The Hindi funeral ritual ends with the remains of the cremated body being sent down the river. 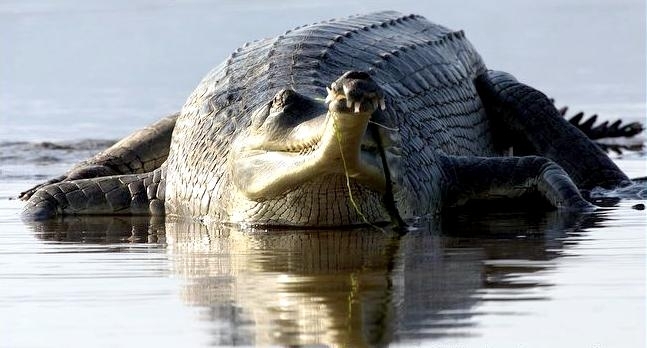 Jewelry is possibly ingested in the same way that stones would be in order to be used as gastroliths, hard objects which presumably aid in digestion and add weight to alter buoyancy.